Wild turkey. Photo: Paul Martin. Click on picture to see a larger version. Wild turkey (Meleagris gallopavo) is one of the largest and most spectacular birds at QUBS. It is also a relative newcomer to the region. Numerous releases by the Ministry of Natural Resources (since the 1960’s but mainly since the mid 1980’s) of wild turkeys throughout Eastern Ontario have resulted in the establishment of a substantial breeding population (Weir 2008). Turkeys are now a common sight at QUBS throughout the year. We report on the diet of three wild turkeys (2 adult males and 1 juvenile) collected at QUBS in October 2010 (Table 1). The two adults were harvested by hunters near the Dowsley Ponds and the juvenile was hit by a car on the QUBS driveway. Although the sample size is too small to draw broad conclusions about wild turkey diets, analysis of crops shows that in at least this case there is a marked difference in diet between age classes. We decided to measure the different food stuffs by dry weight. All crop contents were dried for 5 days at room temperature then weighed using a Mettler AE100 electronic balance. For all three turkeys the main food source by dry mass was vegetable materials, particularly forest mast. The adults ate oak (Quercus sp.) acorns. All four of our oak species germinate in the autumn and most of the acorns contained in the turkey crops had already sprouted. It is unclear whether turkeys actively select sprouted acorns over those that have not sprouted. Presumably sprouted acorns are more nutrient-rich than acorns that have not sprouted. The juvenile crop contained hickory (Carya sp.) nuts but no acorns. It is unclear why the adults should choose acorns and juveniles choose hickory nuts with no overlap. Perhaps there are nutritional differences, digestion requirements or other age-related factors that influence nut selection. This is especially interesting because Northern Red (Q. rubra) and Common White (Q. alba) Oaks produced vast amounts of acorns this autumn, making them an easily obtainable food source, especially for juveniles which presumably have less success in foraging than experienced adults. In adults Lepidoptera pupae also feature prominently in the diet. We were unable to positively identify the pupae to species but they closely resemble the all black and smooth case of Hickory Tussock Moth (Lophocampa caryae), which was very common in the summer of 2010. Acorns and pupae together comprise 99.38% and 98.32% percent of crop contents for the two adults respectively. There were no pupae in the crops of the juvenile; again another presumably easily obtained food source not taken advantage of by the juvenile. There were many other differences in the juvenile’s crop contents compared to that of the adults. After hickory nuts, the next most important item in the juvenile’s diet was sedge (Carex sp.) seeds followed by Orthoptera. There was a wide diversity of orthopteran species in the juvenile’s crop including 11 Northern Green-striped Grasshoppers (Chortophaga viridifasciata), 7 ground crickets (Allonemobius sp. ), 4 Grizzly Grasshoppers (Melanoplus punctulatus), 3 Northern Mottled Grasshoppers (Spharagemon marmorata), and 1 Fall Field Cricket (Gryllus pennsylvanicus). Nuts, insects and probably to some extent sedge seeds provide protein to growing juvenile turkeys. But insects and other invertebrates probably contribute amino acids or other important nutritional components to the diet that are unavailable in mast and seeds alone. It’s known that snail shells are an important source of calcium for egg laying hen turkeys (Eaton 1992). Unlike many of our smaller birds, wild turkeys afford us the opportunity to examine their crop contents because they are collected by hunters and as road kill every year. As we collect more crops we’ll compile a larger database of wild turkey foods that may someday be useful for tracking seasonal and long term changes in diet. The dried crop contents described here are housed in the QUBS natural history collection. Eaton, S.W. 1992. Wild Turkey (Meleagris gallopavo), The Birds of North America Online (A. Poole, Ed.). Ithaca: Cornell Lab of Ornithology. Weir, R.D. 2008. Birds of the Kingston Region 2nd edition, Quarry Press, Kingston. An adult Caspian Tern with a juvenile on the right and a Ring-billed Gull on the left. Caspian Terns typically usurp the highest perches on loafing sites such as Bird Rock on Lake Opinicon. Photo: Philina English. Click on picture to see a larger version. (Larus delawarensis), Herring Gull (L. smithsonianus), Common Tern (Sterna hirundo) and Caspian Tern (S. caspia). All breed colonially, mainly on island in Lake Ontario and the St. Lawrence River and in many cases colonies are over 50 km from QUBS. Although a fair amount of information is available on the breeding activates of these species in the Kingston region we have virtually no information on their behaviour or ecology when they visit Lake Opinicon and other inland waters. Here I present some brief notes on Caspian Terns from August 2010. More observations of this and other species will help us understand the natural history of visiting water birds at QUBS. Time of year: Caspian terns visit QUBS from mid August to mid September. Abundance and occurrence: Up to 12 have been seen foraging over Lake Opinicon or lofting on small rocky islands, particularly Bird Rock off Joe’s Point. In addition to Lake Opinicon, small numbers of Caspian Terns have been recorded at other lakes in the region during the same time period: Newboro, Indian, Big Rideau and Loughborough. Age classes: In general, adult birds seem to outnumber juveniles (young of the year) about three to one. Care of young: Juveniles closely accompany foraging adults or wait on loafing rocks to be fed; in both cases they frequently beg. Foraging: I recorded 9 foraging attempts by one adult around Bird Rock in the course of 30 min. Eight of those foraging attempts (near vertical plunge dives) were successful. On four of those successful hunts, the adult fed a begging juvenile. All prey items were fish but the species could not be identified. Interspecific interactions: Caspian Terns commonly loaf on Bird Rock with Herring Gulls and Ring-billed Gulls. They frequently displace both gulls from the highest points on the rock. Roosting: No sign of overnight roosting of terns or gulls was found with repeated evening checks of Bird Rock off Joe’s Point. Terns and gulls may roost on nearby fields. The reasons why some water birds come inland from Lake Ontario and the St. Lawrence River to forage in smaller lakes while others remain on the larger water bodies is unclear. At least some Caspian Terns find it worth while to bring their young to Lake Opinicon. Is there an advantage for doing so? Do the same birds bring their young every year? How do birds that frequent inland water ways differ from birds that remain on big water? Further research into the behaviour and ecology of these visiting water bird species could be very interesting. 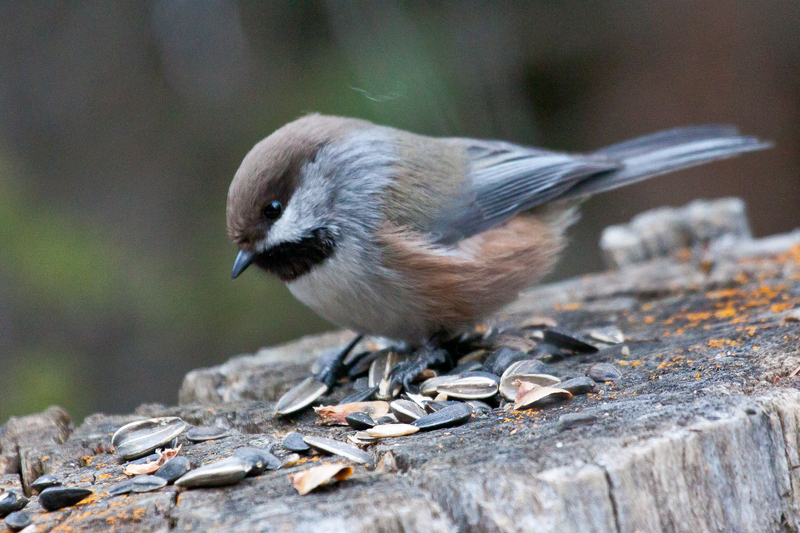 Invaders from the North: Boreal Chickadees. Boreal chickadee. From Wiki images. This autumn birders all over southern Ontario have reported sightings of boreal chickadees (Poecile hudsonicus), anunusual species to see south of Algonquin Provincial Park. Boreal chickadees typically inhabit the true boreal forest but also occur in low densities in the transition zone where the northern boreal forest mingles with the southern Great Lakes forest. In some years irruptions of boreal chickadees occur, bringing many of these birds into parts of Ontario where they do no normally occur. This autumn boreal chickadees have been widely reported in southern Ontario including from Prince Edward County, the Toronto Islands, Hamilton, Presqu’ile Provincial Park, Missassauga and Ottawa (ONTBIRDS listserv archives). Not to be out done, QUBS has also had one boreal chickadee at the Point on October 15. The bird was originally found with a flock of black-capped chickadees (Poecile atricapillus) near the bird feeders at Ironwood Cottage. It was located two days later alone on Cow Island but has not been reported since. This is the first record of boreal chickadee for QUBS. Irruptions of boreal birds southward during some autumns and winters seems to be closely related to the availability of food. Many species of finches, Bohemian waxwings (Bombycilla garrulus), red-breasted nuthatches (Sitta canadensis) and boreal chickadees all irrupt into southern Ontario occasionally in response to shortages in the respective seed and fruit crops each species consumes. Raptors, owls and northern shrikes (Lanius excubitor) may all irrupt when small mammal prey is scarce or hidden under deep snow. There are six other boreal chickadee irruptions on record for the Kingston region, the largest of which was the autumn, winter and spring of 1972-73 when 233 birds were recorded. In that irruption boreal chickadees were recorded between October 15, 1972 and April 7, 1973 (Weir 2008).